Dual overhead phones for stereo sound quality. Volume control. Mute Switch. Light weight adjustable headset for comfort. Discuss gaming strategy with your teammates, trash-talk your opponents or just chat while playing your favorite games like Call of Duty or Halo. Adjustable noise canceling microphone for crisp clear communication. Leave voice messages to your friends and family with Xbox live message service. 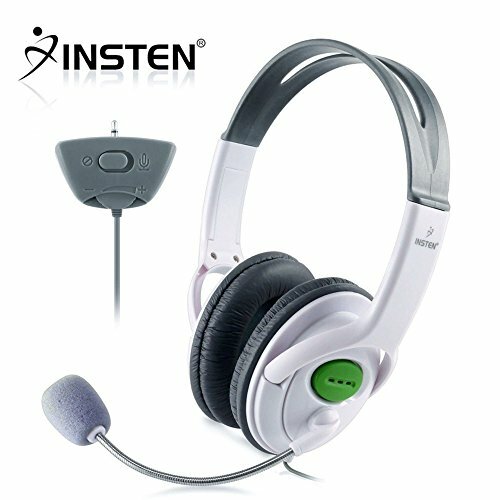 Take your Xbox Live experience to the next level by plugging this headset with adjustable microphone onto your Xbox 360 controller. Immerse yourself in the complete gaming experience. Color: White. Note: Controllers not included, Headset only. NOT compatible with: Microsoft Xbox, Xbox One.